Trace elements occur naturally in soils and some are essential nutrients for plant growth as well as human and animal health. However, at elevated levels, all trace elements become potentially toxic. Anthropogenic input of trace elements into the natural environment therefore poses a range of ecological and health problems. As a result of their persistence and potential toxicity, trace elements continue to receive widespread scientific and legislative attention. 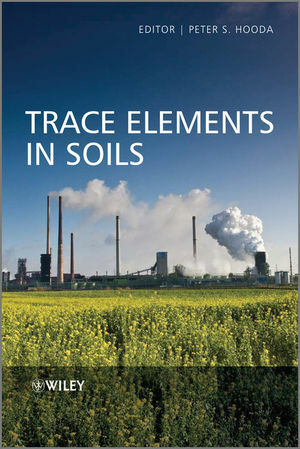 Trace Elements in Soils reviews the latest research in the field, providing a comprehensive overview of the chemistry, analysis, fate and regulation of trace elements in soils, as well as remediation strategies for contaminated soil. • Basic principles, processes, sampling and analytical aspects: presents an overview including general soil chemistry, soil sampling, analysis, fractionation and speciation. • Long-term issues, impacts and predictive modelling: reviews major sources of metal inputs, the impact on soil ecology, trace element deficient soils and chemical speciation modelling. • Bioavailability, risk assessment and remediation: discusses bioavailability, regulatory limits and cleanup technology for contaminated soils including phytoremediation and trace element immobilization. Written as an authoritative guide for scientists working in soil science, geochemistry, environmental science and analytical chemistry, the book is also a valuable resource for professionals involved in land management, environmental planning, protection and regulation. 14.7. Risks to wildlife during phytoextraction operations?